Room Classics - Dining Room — Patricia McLean Interiors, Inc. The dining room, the central axis of the house, has been transformed into a secluded garden party. Hand-painted Gracie panels customized in Hong Kong for the room set the stage. Yellow, peach and terra cotta flowers among the green grasses and trees span the garden wall. The mood is formal, yet fun-loving. 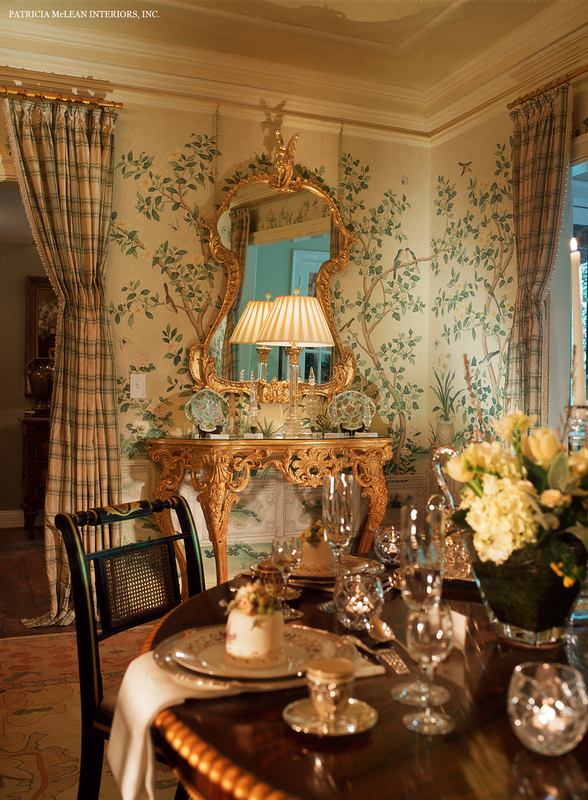 Guests are seated at two round Regency-style tables imported from England for the long room. Double-cased door openings on three sides showcase the dining room. Draperies in Brunschwig & Fils silk plaid and glass bead fringe mounted on gilt bamboo poles soften the mood and add volume. The airy carving on a pair of Italian consoles allows the hand-rendered flowers, butterflies and birds on the panels to peek through. Custom mirrors above add sparkle. Individual Regency-style upholstered ottomans allow ladies a perch for evening bags. Antique celadon porcelains lend an elegant air. The tables’ settings are worthy of the most exciting garden party. An exceptional and rare ivory Sultanabad rug anchors the setting.